What if I told you there were optimal times to train in the day? That’s probably something you’d be interested in hearing. The truth is, there are times throughout the day that are more optimal than others for training. The short answer, 3 hours and 9 hours after waking are considered more optimal times to exercise. Why? Circadian Rhythm. Our body, and every cell, operate off internal clocks governed by the suprachiasmatic nucleus (SCN). The SCN works in tandem with the pineal gland, known for secreting melatonin in the presence of darkness. The SCN communicates its rhythmical signal of night and day (also known as Circadian Rhythm) to the body and brain modulating hormonal production. From a reductionist perspective, as the day begins, the body preferably secretes and utilizes cortisol, our main stress hormone, to drive activity and our wake state. 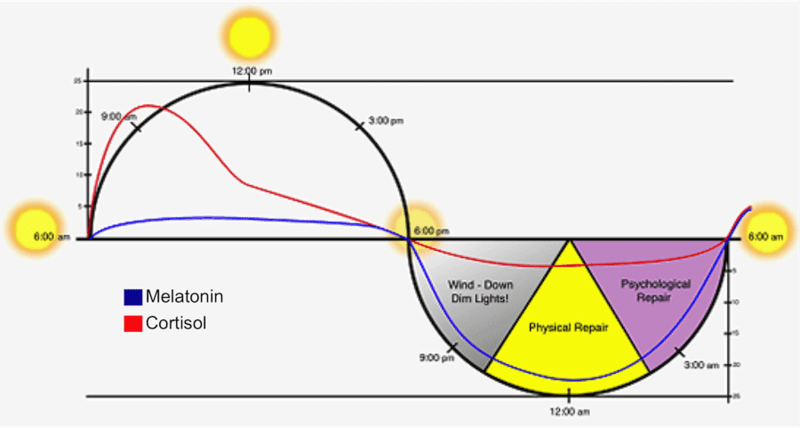 As the day wears on, along with the sun beginning to drop, melatonin begins to steadily rise moving us closer to a state of rest. These two hormones complement each other: when one is high, the other is low. If you look at a daily cortisol curve (see graph below) you’ll see cortisol on the upswing a bit before midday (around 9-10am) and slowly dropping after midday (2-3pm). Which happen to be about 3 and 9 hours after waking for someone who rises at 6am. These become our opportune times to train and utilize cortisol and other sympathetically driven hormones to our advantage. Why would this be an advantage? 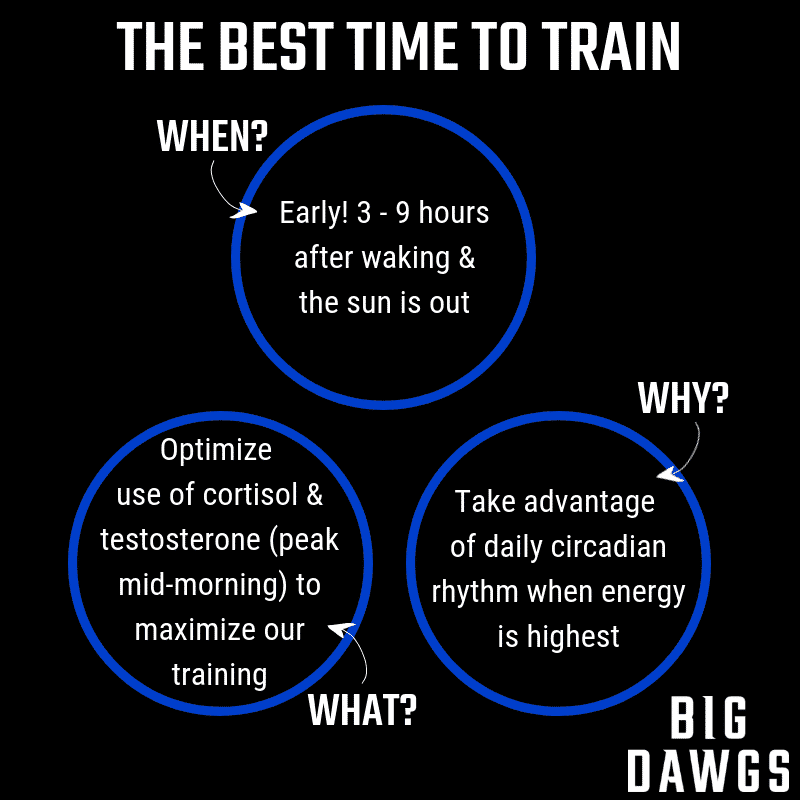 By optimizing the use of cortisol and testosterone, which peaks in the mid-morning, we can utilize natural increases in appropriate hormones to maximize our training response. Additionally, by training when these hormones are on the rise we won’t negatively impact our ability to rest and wind down, working against our circadian rhythm. Why would this be a potential issue? If we train too late in the day when our body is transitioning into a rest and recovery state, we can cause an excessive spike in cortisol prolonging our onset to sleep. When the sun is down for the day, the last thing we need to be doing is producing a stress response (training is a stressor). By disrupting our circadian rhythm, we are impairing our ability to rest and recover effectively. What if I can’t train during those times?